Stumpy is now 19yo and still loving life as the top cat inside with us! 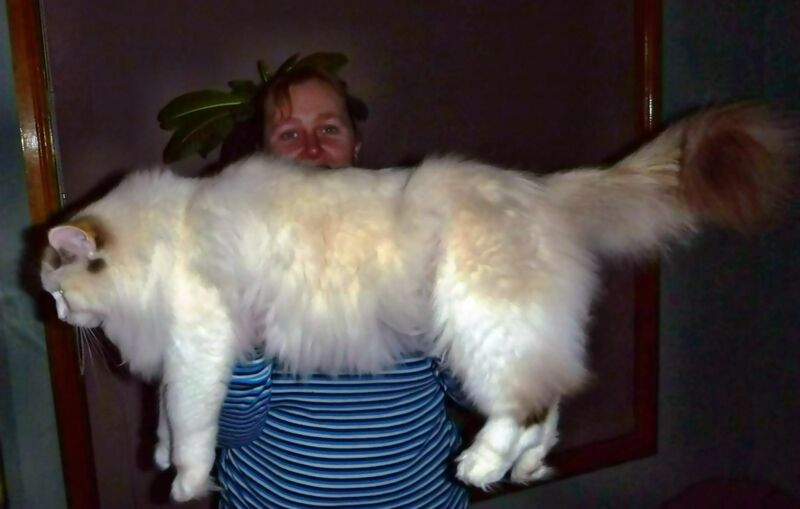 This is to illustrate the size Ragdolls CAN get to... and Maggie, even tho a Desexed Female, STILL has 3yrs to continue to grow and develop as Ragdolls grow until they are 5yrs of age!! Maggie is only 1yo in this picture, and it is not photoshopped in anyway! The original cats that began this gorgeous breed were a white Angora 'like' cat called Josephine, and a Birman 'like' cat named Daddy Warbucks, who was also one of Josephine's kittens from a previous litter. All Modern Ragdolls can be traced back to these cats. 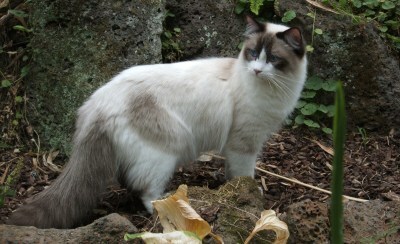 The Ragdoll cat breed originated in the USA in California in the late 1960's early 1970's. Developed originally by a lady called Anne Baker in California, she noticed that a cat that was owned by her neighbour (Josephine) was producing kittens with a strange characteristic that had them very loving towards humans, and 'flopped' when picked up and held. She noticed that this had only developed once Josephine had been cared for at the local University, following a car accident. Anne Baker had some 'different' theories regarding these new characteristics she observed, including feeling that the University had introduced alien DNA or human DNA during Josephines recovery at the University, and even claimed she had introduced racoon's into her breeding!! 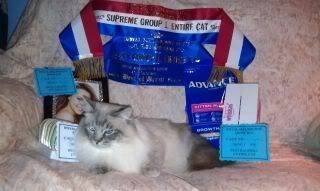 From careful selective breeding (from selected cats), the breed was developed carefully over the years, Firstly with the dedication of Anne Baker, then later on, by other dedicated breeders. 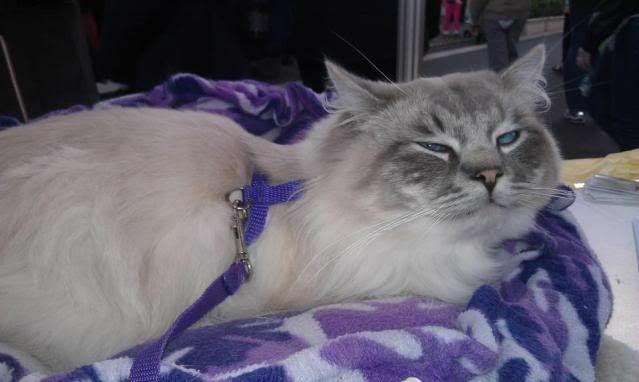 The Ragdoll comes in three wonderful coat patterns, 'Pointed' is where the colour is at the extremes of the feet, face, ears and tail...'Mitted' is were the colour on the feet has white markings, or gloves. Also common on the pattern is a 'blaze' on the nose....'Bi-Colour' has the coat colour on the body, with white on the legs, face and extends up the chest between the front legs. Seal - Points are deep Seal Brown, body colour can range from fawn, cream to a warm brown. Blue - Points are slate-blue or silvery-blue grey, body colour is ivory or bluish white. Chocolate - Points are light milk chocolate, body colour can range from ivory to cream. Lilac - Points vary to frosty-grey lilac, to pinkish beige, body colour is a warm magnolia colour. Reds, tortoishell, cream, lynx (Tabby) are all fairly new developments in the colours of Ragdolls. 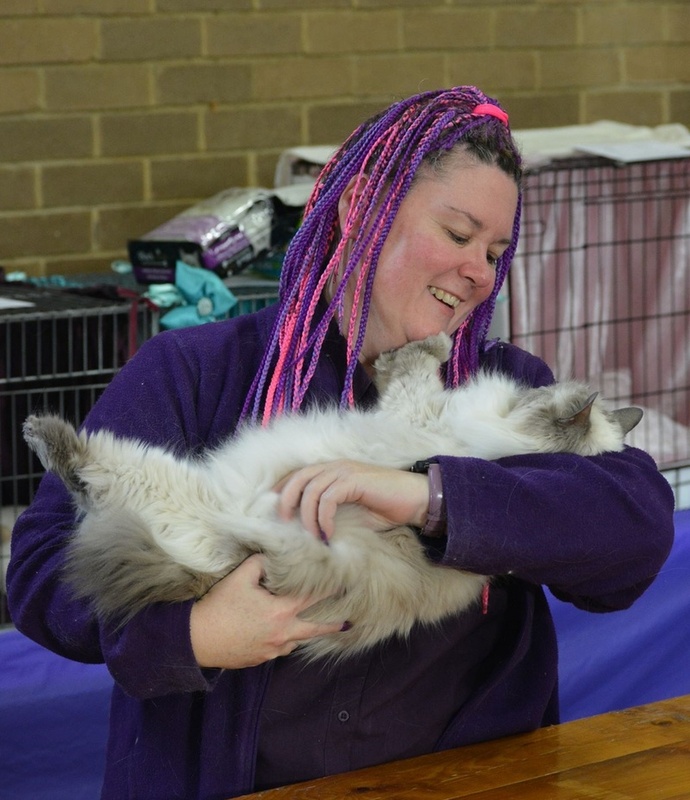 Ragdolls are a wonderful breed that are suited to all types of cat lovers, from an active family, or couple, to a quiet or retired home. Ragdolls got their name by their peculiar tendency to 'flop' when held, tho some are better at this than others! This quality can also take a few months to develop completely. Come in and have a look around at our gorgeous cats...both past and present.